Crates personalised with your company branding and logo, at an unbeatable price. No logo? Why not add your website address or contact information to the side so potential customers can easily get in touch. 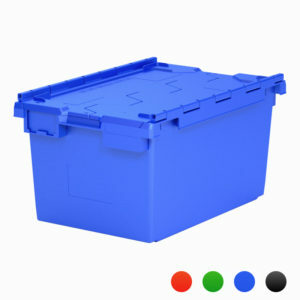 Crates manufactured in your company colours, the size you want, at an unbeatable price. Want your company branding on the side? We can do that too! If you would like any information on our products or services, then don't hesitate to get in touch. Our crates clever design means the base of the crates fits securely onto the lid to stop it moving during transit. When they aren’t in use they are nestable to save on valuable storage space. Simply open the lids and nest them together. 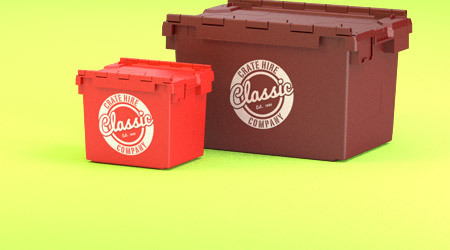 Our Lidded crates will protect your items from damage. 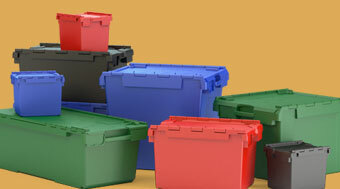 The Heavy duty, rugged and robust plastic is built for protection. If security needs to be increased, use our security seal/cable ties. We aim to be the best crate manufacturer in the UK, and we already supply our premium quality containers to many of the leaders in the commercial relocation market. 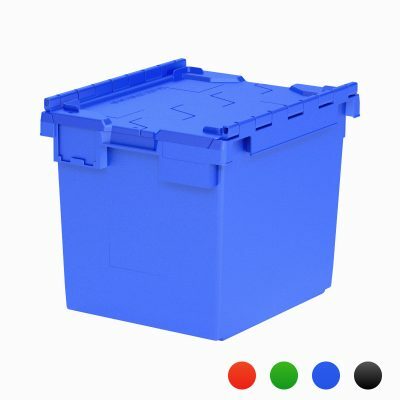 We specialise in manufacturing robust plastic stacking crates, weatherproof plastic storage crates, heavy duty plastic removal boxes and sturdy plastic lidded containers. What’s the difference between these? Well, nothing! In the UK these crates are often called different things, but the crates themselves are the same. Occasionally our clients require open top crates (without lids), but these have fallen out of favour in the commercial relocation markets. However, we can produce them as per your requirements so get in touch, and we can make them to order. We just prefer the added security, protection, stack-ability and weatherproof aspects of the lidded crate. The L1C is the smallest crate Advanced Crates produce and is often referred to as a ‘locker crate’ or ‘personal crates,’ ideal for moving patient, staff or your personal belongings safely and securely. The L1C hire crate is a heavy duty plastic container featuring integrated lifting handles and interlocking lid. Designed to store or move items that are A4 or smaller in size. e.g., paper, brochures, magazines. For added security use our security seals. Available to buy today from our online store in Red, Green, Blue and Black. Or buy crates made to order in the colour you want. The L2C is slightly smaller than the “standard crate” the L3C. Our medium L2C crate or “stair crate” is a compact lidded moving container perfect for easier handling on stairs. 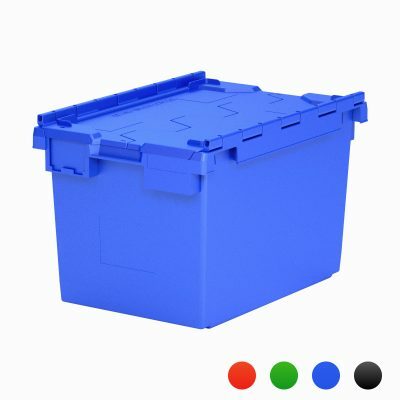 One of the most popular plastic moving boxes for home moves especially with many stairs. The L2C is also widely used in retail and distribution. 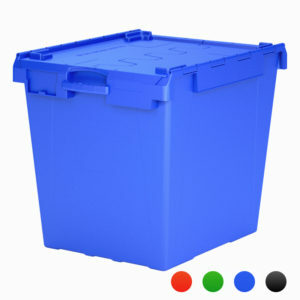 The plastic retail tote is a heavy duty plastic crate featuring integrated lifting handles and interlocking lid. Designed to store or move items safely and securely while also being narrow enough to use easily on stairs. Don’t forget to use our crate security seals when added protection is necessary. 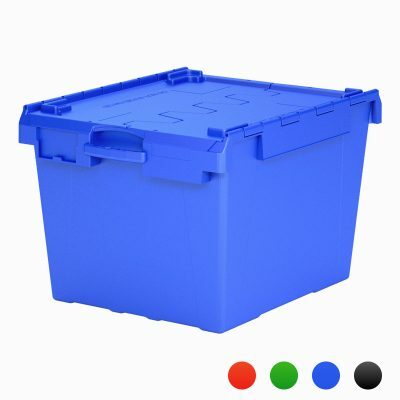 Our standard lidded 80-litre crate also known as the ‘standard crate’ is our most popular crate and is the most popular plastic moving box within the commercial relocations and removal industry for easily moving home or office. Designed to work with the un-lidded A3 crate due to its matching dimensions. Made from heavy duty plastic featuring integrated lifting handles and interlocking lid. The tops fold neatly by the sides of the containers meaning less wasted space when storing unused crates. Designed to store or move your items safely and securely due to it’s strong, robust and also weatherproof construction. For added security use our security seals. 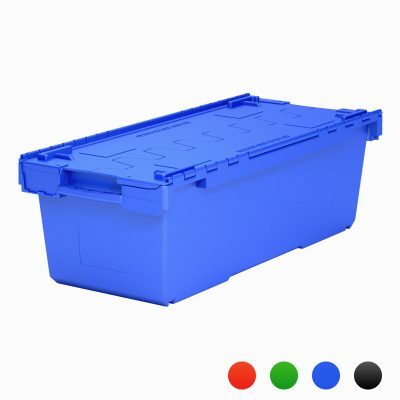 The L6C metre long plastic (ALC) lidded packing crate we produce is designed specifically for relocating libraries or large lateral filing systems. The metre-long design is the same width as the standard library shelf for simple, easy and straightforward moves. It can, of course, be used to move any larger items that may not fit in the smaller crates. The L6C hire crate is a heavy duty plastic box featuring integrated lifting handles and interlocking lid. 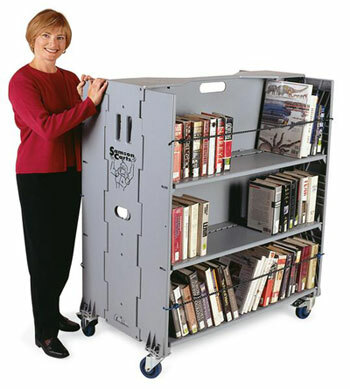 This is a great choice for bulk storage and easy moving of valuable books or folders. For added security with sensitive files or valuables use our crate security seals. The IT3 Computer crate is perfect for the packing and moving of a whole computer from one location to another. Designed to accommodate a flat screen monitor, computer, mouse, keyboard and cables for transport in a safe and secure way. It features the same heavy duty plastic design, integrated lifting handles and interlocking lid as the IT6. For added protection of electrostatic-sensitive equipment such as computers and their components, we recommend our anti-static bubble wrap. For added security use our crate security seals. Advanced Crates supply some of the biggest and best commercial relocation and crate hire companies in the UK. We have a selection of crates made and ready to be delivered to you. Our fleet of vehicles and close collaboration with couriers means that we are capable of delivery a few or many hundreds of crates to you at a very competitive price. We offer premium next day delivery on items that are in stock in our store – Bespoke manufacture delivery timeframes will be discussed with you when ordering. 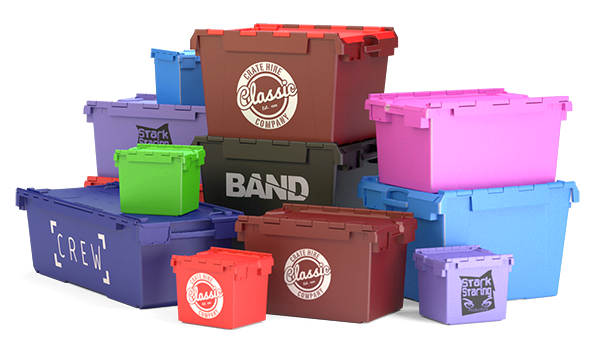 Our plastic ALC container boxes are ideal for commercial relocation companies, crate hire companies, and retail & distribution. 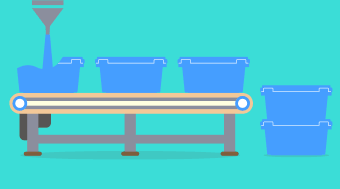 And if you need to top-up your pool of containers or retail totes – we can usually have crates in our shop with you next day. With help from our partners, we have service centers across the UK, so we’re never far from where you need us. London has grown to be a massive city – the biggest city in the UK. As such, a lot of the work we do is based in and around London and there special considerations to make. Our fleet of vehicles is LEZ (Low Emission Zone) compliant and thus they can deliver your products within the LEZ. We deliver to Central London, West London, East London and South London which includes the London boroughs; Barking and Dagenham, Barnet, Bexley, Brent, Bromley, Camden, City of London, City of Westminster, Croydon, Ealing, Enfield, Greenwich, Hackney, Hammersmith and Fulham, Haringey, Harrow, Havering, Hillingdon, Hounslow, Islington, Kensington and Chelsea, Kingston-Upon-Thames, Lambeth, Lewisham, Merton, Newham, Redbridge, Richmond-upon-Thames, Southwark, Sutton, Tower Hamlets, Waltham Forest, Wandsworth.